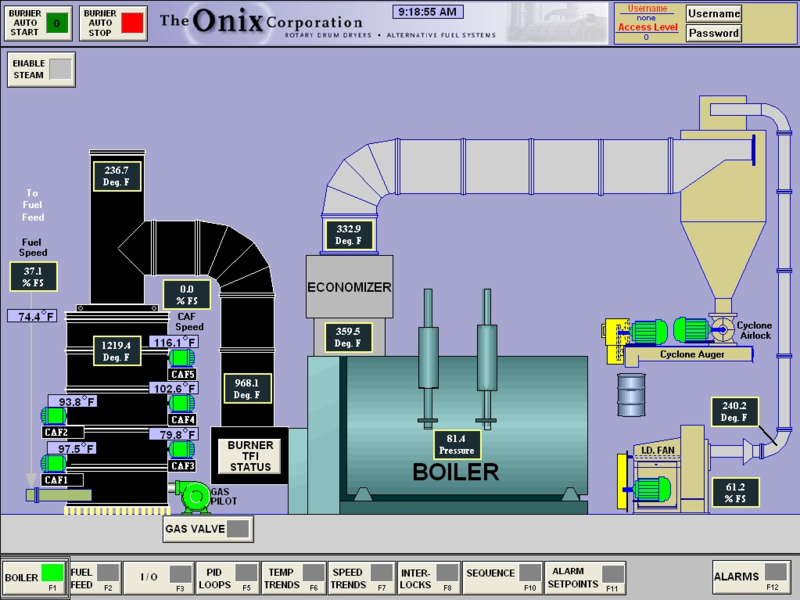 The ONIX Corporation offers a full line of steam and hot water boilers to complement The ONIX Corporation alternative fuel burner. The ONIX Corporation offers a full line of steam and hot water boilers to complement The ONIX Corporation’s alternative fuel burner. These boilers harness the energy from hot flue gas (1200-1800°F) and can produce ultra high pressure steam (@1,800 PSI) at 50,000 lbs/hr (1500 bhp) in a single equipment train. This is ideal for any industrial application requiring steam at a reduced cost or the need to use a carbon-neutral biofuel. These systems are equipped with PLC control systems which automatically modify the fuel feed rate to match the desired boiler outlet pressure. As a pressure controller on the boiler senses a demand for steam, three things happen simultaneously: 1) fuel feed rate increases to burn more fuel; 2) combustion air to the burner increases in direct proportion to fuel feed rate; and 3) the induced draft fan’s speed increases to draw more hot gases through the boiler and generate more steam. The ONIX Corporation offers many different options for the delivery of solid fuel to the burner. The ONIX Corporation’s fuel tank delivery system stores fuel in an anti-bridging fuel tank mounted on load cells. These load cells track fuel consumption and display fuel level in percent full through the Onix-OS©. The ONIX Corporation’s tank delivery system has a high level sensor to prevent tank over-filling. 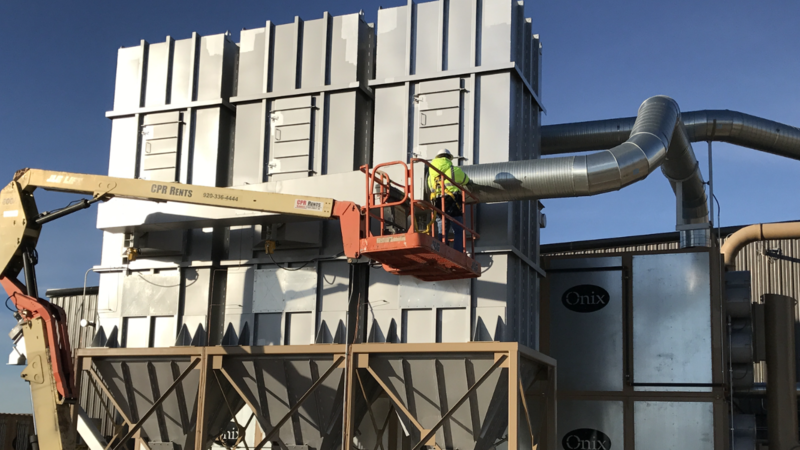 The ONIX Corporation’s hopper feed system has an anti-bridging fuel hopper that is loaded via a front end loader or conveyor. These hoppers are located in the fuel receiving, storage, and handling warehouse at the client’s facility. The hopper feed system can also be equipped with load cells. The ONIX Corporation’s fuel hoppers have a low level sensor that sends an alert signal to the Onix-OS© to alert operators to low tank level. The fuel from either system is fed on demand to the burner via a command signal from the Onix-OS©. The fuel is metered, pulverized, fluidized, and pneumatically delivered to the solid fuel burner for instant combustion. The fuel delivery system can be located up to 400 feet away from the solid fuel burner combustion vessel. The fuel delivery pipe can be routed overhead or underground to favor customer installation conditions. In the combustion of solid fuel, the process will often produce inorganic ash. This ash carries out of the solid fuel burner and into the boiler. The ash is further entrained through the implementation of soot blowers (steam or air). 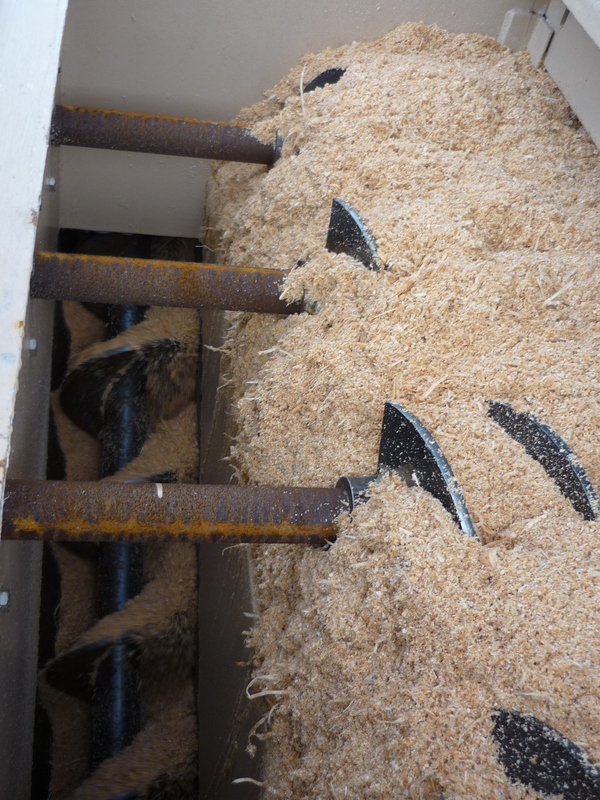 The ash then enters the boiler ID (induced draft) fan and is routed to a bag filter for capture and control. This form of pollution control is considered BACT by the EPA and compliant with boiler MACT. For more information on our Particulate Control Systems, please click on the following link.